BLOGHow to save Capital Gains Tax on Property sale? Profits or gains arising from transfer of a capital asset are called “Capital Gains” and are charged to tax under the head “Capital Gains”. Indexed cost means the inflated cost of the asset which is taken out by dividing the index number of year of sale and index number of year of acquisition of the asset. 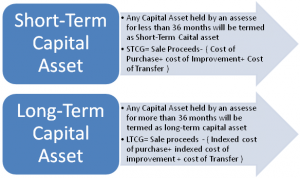 LTCG stands for Long-Term Capital Gain and STCG stands for Short-Term Capital Gains. Indexed cost also stands for Adjusted for Inflation. What is Capital Gains tax on sale of property? The Income Tax Department imposes taxes on capital gains. These taxes are capital gains tax. If a property has been owned by you for less than 3 years and you have sold it, short term Capital Gains tax has to be paid else the terms of Long Term Capital Gains tax have to be applied. Short Term Capital Gains tax is paid as per income tax slab that one falls under. Long Term Capital Gains tax is set at 20%. How do I save Capital Gains Tax from sale of Property? Purchase of residential house during 1 year prior to or 2 years after the date of the transfer of property. Construction of residential property within 3 years from the date of transfer. It may be noted here that with effect from 1st April, 2015, such investment can be made only in one residential property located in India. If the new property is sold before expiry of 3 years from the date of acquisition/construction, then for the purpose of calculating capital gain for such property, the cost of acquisition shall be reduced by the amount of capital gain exempted earlier. In case, the new property could not be acquired/constructed before the due date of filing of return for that year, the amount sought to be invested can be deposited in Capital Gains Account with any authorised bank. Generally, most of the public sector banks are authorised under the Capital Gains Account Scheme. Note that the amount so deposited shall be eligible for exemption as if it has been utilised for purchase/construction of new residential house property, however, if any amount so deposited, remains un-utilised at the end of 3 years from the date of transfer, it shall be chargeable to tax in that year. If you have sold property but do not wish to invest in another property soon, you can invest in bonds issued by National Highway Authority of India (NHAI) or Rural Electrification Corporation (REC) to save capital gains tax. You can invest up to Rs. 50, 00, 000 in the bonds within 6 months of date of sale of property. The bonds must not be sold up to 3 years from the date on which property was sold. It has to be noted that you should invest before the returns filing date if you wish to claim exemption in that financial year. Section 54F: Section 54F states that any gain realizing from the sale of any long-term asset ( Apart from residential asset ) shall be fully exempt if the entire net sales is invested in purchasing of 1 residential house within 2 years or before 1 year from the date of such transfer OR the net consideration is invested in construction of 1 residential within 3 years after the date of such transfer. Amount exempted = Capital Gain X Amount Invested/Net Sale consideration. Kindly note, at the date of such transfer the assesse should be in possession of not more than 1 residential house apart from the house that he is investing his capital gain into. What if you have loss in selling of a property? Things do not always work out according to the pans. 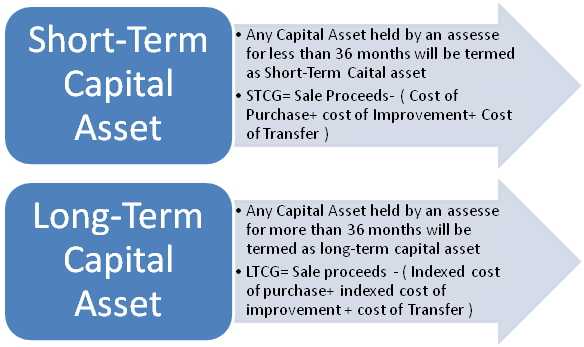 If you end up in loss after selling your property, then that Long Term Capital Loss (LTCL) can be set off from long term capital gain ( LTCG ) arising from sale of any asset ( apart from gains arising from sale of shares, mutual funds etc on which STT has been paid ). If the capital loss cannot be fully set off in that particular financial year, then it is allowed to be carry forward for 8 years but should be set off under the same head only.